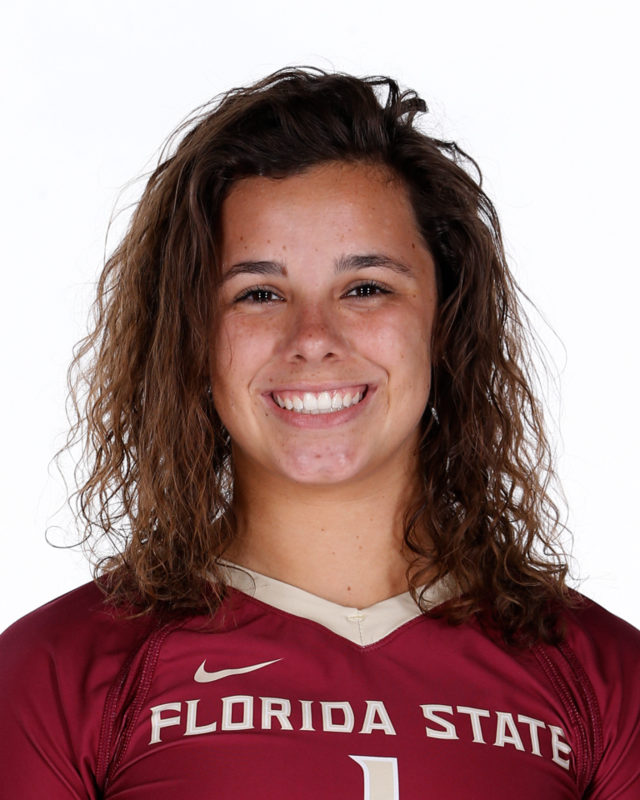 Roberts saw an outstanding first season with the Seminoles as the only consistent true freshman in the lineup … Capped off her freshman campaign with 174 digs and 11 service aces over 98 sets … She earned double-digit digs on seven occasions, with a season high of 20 (against Notre Dame, 11/11) … As one of the most consistent servers, she earned 11 aces with only five errors in the season with a high of two aces (at Notre Dame, 11/2) … In her collegiate debut against Wisconsin (8/25), she played in three sets and saw two digs, served twice and received six serves … Against Colorado State (9/1), she earned her first career ace and saw picked up six digs … Saw her first double-digit dig outing with 11 at Boston College (10/12) and set a season high with 4 assists … Went on two earn 10 digs in each of the next two matches at Syracuse (10/14) and against Georgia Tech (10/19) … Had a career day at Notre Dame (11/2), picking up 2 aces with no errors and 13 digs … topped her career high the following weekend against the Fighting Irish (11/11), earning 20 digs … Saw eight digs in her first NCAA Tournament match against Florida (11/29). Coming off a stellar high school career and four consecutive Class 1A State titles, Taylor Roberts came to Tallahassee from Sneads, Fla. Roberts was a crucial part of a historic run at Sneads High School, where they are currently tied for the third longest championship run in FHSAA history. Roberts’ senior class never lost a set to a 1A team, and only saw 22 losses in four years. She finished her career with 1,126 digs, a .266 hit percentage, and 348 aces paired with a 22.3 ace percentage. Roberts picked up a number of individual awards as well, as she was named Player of the Match 14 times in her four years at Sneads. Prior to high school, Roberts competed in the 2013 USA High Performance Championship as a member of Team Florida. As a sophomore, she was named to the 2015 USA Volleyball A-I National Team. She was named to the AVCA Phenom list in 2016, alongside FSU classmate Morgan Chacon. Roberts also received an Under Armour All-American honorable mention in her final season. Roberts comes from a long bloodline of volleyball players, as her mother, Sheila Roberts, led Sneads High School to five state championships as head coach, and will now coach for Florida High while maintaining her position as the co-director for ProStyle Volleyball Academy. Taylor Roberts follows right behind her older sister, Ashlyn, who also played for Sneads and currently plays for South Alabama. Born June 13 … Daughter of Sheila and Jason Roberts … Sister of Ashley Roberts … Majoring in psychology … Her mother, Sheila Roberts, coached volleyball at Sneads High School for 14 years and earned five consecutive Class 1A state titles, and is now the coach at Florida High and the co-director of ProStyle Volleyball in Tallahassee … Her sister, Ashlyn, plays volleyball at South Alabama.